Who? Dozens of civilians die in Kyrgyzstan unrest. What? Violence between Kyrgyz majority and Uzbek minority has claimed the lives of up to 40 people and wounded more than 500 others. Where? The bloodshed took place in the southern city of Osh and the neighbouring districts of Karassu, Arava and Uzgen. When? Reports say the riots erupted when two groups in a casino clashed with each other on Friday. Why? Uzbeks complain they do not have a proportionate representation in the local, regional and central administrations and face discrimination and persecution. Despite being spoken by around 15% of the population, Uzbek is not an official language of the Central Asian republic, a main issue of discontent among Uzbeks. Power, they argue, stays in the hands of main Kyrgyz clans. How? Previous deposed regimes of Askar Akayev and Kurmanbek Bakiyev faced heavy opposition from the Uzbek minority that dominates the southern region of Kyrgyzstan. Both Kyrgyz and Uzbek groups unified to overthrow Bakiyev in May and install the opposition government in Bishkek. 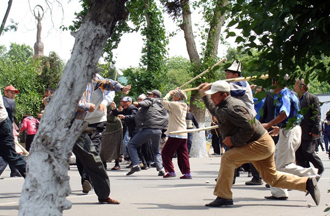 Remnants of Bakiyev regime in the south have attacked Kyrgyz and Uzbeks for supporting the new government. Moign Khawaja specializes in politics, current affairs and world conflicts. He also takes deep interest in society especially religious and cultural festivals. He has MA degrees in Journalism and International Affairs.